Protein stains of normal and colorectal tumor tissue are shown for a single patient. 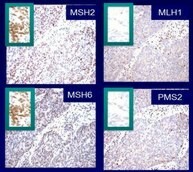 The stains from the tumor (in four insets) show the presence of MSH2 and MSH6 (the dark stain is visible) and absence of MLH1 and PMS2 (the dark stain is not visible). Immunohistochemical tumor testing for protein expression of the MMR genes associated with Lynch syndrome, depicted for a single patient with colorectal cancer. Protein expression is preserved for MSH2 and MSH6 (inset) and absent for MLH1 and PMS2 (inset). Absence of MMR protein expression is suggestive of Lynch syndrome and warrants additional evaluation.